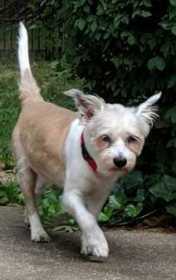 Posey is a white/tan Terrier mix, about 35 lbs, she is friendly, knows her name and comes to food. She did not have a collar or tags on. Posey was last seen at the corner of Randolph & Englewood around 3pm on Monday 2/4. A friendly witness' description of the person who picked Posey up was a woman in her 50s-60s with pixie-short brown hair and glasses. The woman was driving a light blue 4-door sedan with a graphic license plate.